Turkish Navy has entered the age of autonomous unmanned vehicles (AUV). This transition happened without much fanfare or publicity. The above photo was published on Turkish General Staff website and shows the deck of the Aydın class minehunter TCG Anamur during the ITALIAN MINEX-18 held in Italy between 21 and 29 May. The orange and yellow gadgets on the back of the deck are practice mines used during the exercise. The large yellow device partially visible on the left is a French-made PAP-104 underwater unmanned vehicle used for exploration, identification and sometimes for the destruction of mines. That system is remotely controlled and is not fully autonomous. This is the standard ROV of all Turkish minehunters. The yellow torpedo-like object, in the middle, is of much interest. It is a Gavia autonomous underwater vehicle made by Teledyne Gavia. According to the information provided by the company, GAVIA (AUV) is a self-contained, low logistics, modular survey platform capable of delivering high-quality data while operating from vessels of opportunity or from the shore. The system is field proven for applications that include MCM, SAR, and ASW training. The field-changeable and easily transportable modules make it well suited for rapid response to emerging requirements. At least two 1000m rated systems were delivered in 2016. One is named Uluç Bora and the other Barbaros Dora. In one press release, the company states the end user as Turkish Air Force and the AUV’s will provide TAF with highly effective deep water, rapid response capability. I sincerely believe that the there is a mistake. Usually, all underwater operations are the responsibility of Turkish Navy. 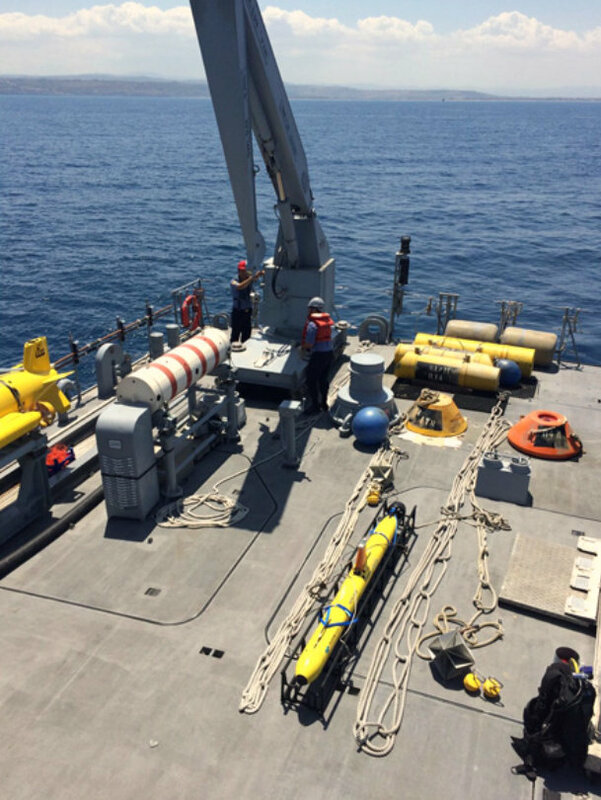 And currently, these AUV’s are operated by the Turkish Navy Mine Countermeasures (MCM) command in Erdek. The most striking specialty of this UAV is its modularity. The vehicle can be configured even on the field by adding modules or taking them out according to the mission requirements. The length and the weight of the AUV’s vary according to the modules it has. Though it is not confirmed I believe each Turkish GAVIA has in addition to the nose, battery and propulsion modules one DVL-aided INS module, one side scan/bathymetry sonar module, one multibeam profiling module. Among other naval operators of GAVIA AUV are Poland and Russia.